Barefoot on a forest floor as she slowly walks forwards, this Fairy’s long green dress hangs down to the floor, trimmed with gold. 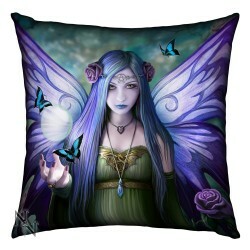 In her left hand she holds a purple rose, matching her delicate purple wings that are outstretched behind her, and in her right hand she has a crystal ball. Blue butterflies fly about her, one settling on the crystal, and a delicate gold chain sits above her hair, holding a pentagram on her forehead. More purple roses sit in her long blue hair as she holds your gaze, calm and unafraid.